WASHINGTON — President Donald Trump eased up on his threats to close the southern border as officials across his administration explored half-measures that might satisfy the president’s urge for action, like stopping only foot traffic at certain crossings. Facing a surge of Central American migrants trying to enter the U.S., Trump last week threatened to seal the border this week if Mexico did not immediately halt all illegal immigration into the U.S., a move that would have enormous economic consequences on both sides of the border. While Trump on Tuesday did not back off the idea completely, he said he was pleased with steps Mexico had taken in recent days and renewed his calls for Congress to make changes he contends would solve the problem. Later Tuesday, Homeland Security Secretary Kirstjen Nielsen held an emergency call with Cabinet members and White House aides, saying, “We are going to treat it as if we have been hit by a Category 5 hurricane,” according to a person on the call. The person was not authorized to discuss the call publicly and spoke to The Associated Press on condition of anonymity. Nielsen was creating an emergency operations center and named U.S. Border Patrol official Manny Padilla as an operational crisis coordinator to manage the response from within the different immigration agencies at the Department of Homeland Security. Padilla is a 30-year Border Patrol veteran and was recently the head of the Rio Grande Valley Sector in Texas. His job will be different from that of the immigration or “border czar” that Trump is considering, the official said. Closing the border completely would disrupt manufacturing supply lines and the flow of goods ranging from avocados to cars, making for a “potentially catastrophic economic impact,” in the words of Republican Sen. Mitch McConnell, the Senate majority leader. Some inside the administration also worry it would only exacerbate illegal immigration. Meantime, administration officials grappled with how they might minimize the impact of a shutdown or implement less sweeping actions. White House economic adviser Larry Kudlow, for example, told CNBC he’s been looking at potentially keeping truck lanes open. White House spokesman Hogan Gidley said in an appearance on MSNBC that closing only certain entry ports, or parts of all of them, could be among the steps short of closing the entire border. It was a shift from Trump’s threat late last week to seal the whole border, and quickly. “I am not kidding around,” he said then, exasperated by the swelling numbers of migrants, thousands of whom were being released into the U.S. because border officials had no space for them. Arrests along the southern border have skyrocketed in recent months and border agents were on track to make 100,000 arrests or denials of entry in March, a 12-year high. More than half of those are families with children, who require extra care. 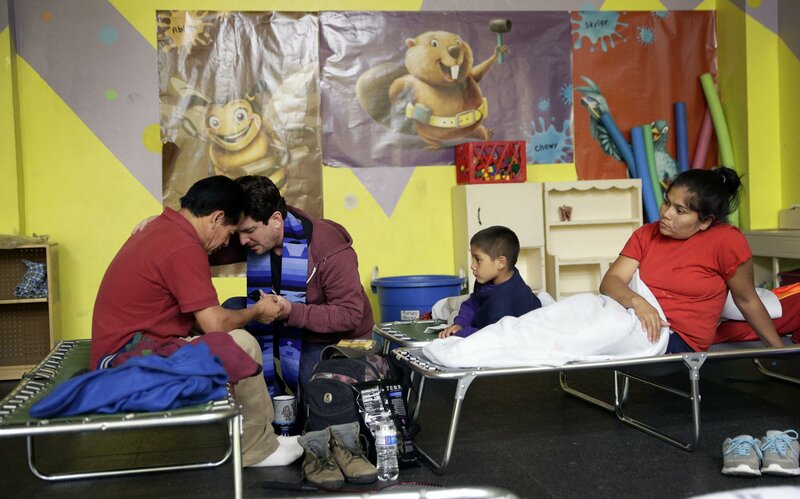 With southern border facilities near a breaking point, U.S. officials are busing many migrants hundreds of miles inland and dropping them off at bus stations and churches. Trump has mocked and vowed to end that “catch and release” practice but overwhelmed authorities saw no choice. Responding to Trump’s threats, Nielsen rushed home late Monday night from Europe, where she was attending G7 security meetings and intended to fly to the border mid-week to assess the impact of changes already made, including reassigning some 2,000 border officers assigned to check vehicles to deal with migrant crowds and new efforts to return more asylum seekers to Mexico as they wait out their case. Officials were hoping to have as many as 300 asylum seekers returned to Mexico per day by the end of the week near Calexico and El Paso in Texas and San Ysidro in California. Right now, only 60 a day are returned. Nielsen has also requested volunteers from non-immigration agencies within her department and sent a letter to Congress seeking more money and detention space and broader authority to deport families faster. The request was met with disdain by Democrats. Even absent the extraordinary step of sealing a national border, delays at border stations have been mounting due to the personnel reassignments, Homeland Security officials said. When the Otay Mesa, California, entry port closed for the night Monday, 150 trucks were still waiting to get into the U.S.
Shutting certain border stations or parts of them would not be unprecedented. Over the Thanksgiving holiday last year, Trump claimed he’d already “closed the border” after officials briefly closed the northbound lanes at San Ysidro, California, for several hours in the early morning to bolster security because of concerns about a potential influx of migrant caravan members. Mexican officials announced Monday they’d pulled 338 Central American migrants —181 adults and 157 children — off five passenger buses in a southern state that borders Guatemala, and said they had detained 15 possible smugglers on immigration law violations. But that was not unusual for Mexico, which has for years been cracking down on migration. In 2014 then-President Enrique Pena Nieto launched a program that was described as ensuring orderly migration but in practice resulted in making it much more difficult for Central Americans to transit.